Gone are the days when you used to install just one type of tile in your kitchens. Today, homeowners have the luxury to use many different types of tiles and they all enhance the look of the cooking area. So make sure to choose kitchen tiles astutely. Glossy tiles may not prove a smart choice for flooring as it doesn’t offer a firm grip and loses shine over time if there is heavy traffic in the area. Here are tips for selecting the right type of tile and application for your cooking area. An expert interior designer in Lahore would suggest you select the surface before choosing a tile. You can use tiles as the backsplash behind the cooking stove, underside of the cabinets, or on the walls. Tile can also be used on the countertops as well as the kitchen floor. The word ‘tile’ means a resilient material that can be laid on the surface in rows. 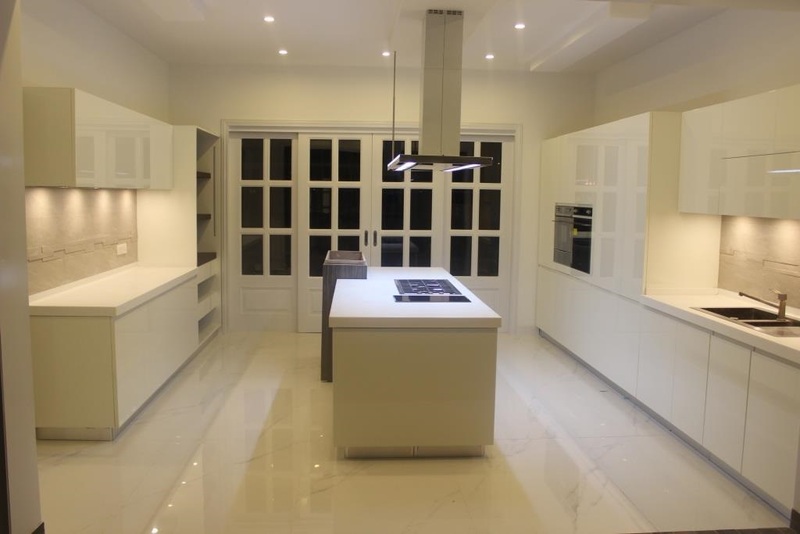 For kitchens, this may comprise stone, ceramic, glass, bamboo, cork, vinyl, quarry and porcelain. Bamboo, cork, and vinyl tiles are generally used in flooring. While porcelain, ceramic and quarry can be applied on floors and counters. Glass tile, however, is commonly reserved for backsplashes and walls. Kitchen tiles such as custom designed, linoleum and vinyl can be expensive. Make sure to do your homework prior marrying to an envisioned look in your mind. You can get a good estimate of the tiles for your kitchen from tile and home improvement stores. Also, it will trim down the selection process by highlighting the tiles that best meet your budget. Although kitchen tiles are resilient, but they require upkeep because each material differs in durability. For instance, ceramic tiles are the best choice for countertops because they are durable, hold up well against heat and are relatively easy to maintain and clean. But, due to its uneven surface, ceramic tiles can get cracked or chipped easily. Pick a tile finish that best match with your family’s lifestyle. Pick a tile that is durable enough to withstand heavy traffic flow, liquid, food spills and cleaning supplies in the area. When buying tile for floor make sure that it is called ‘floor tile’. If you pick wall tiles for the floor the COF (coefficient of friction) will be lower than normal. Meaning, it will be too slippery for walking. Instead, opt for a floor tile that has slightly raised texture or pattern to it so it can provide a safer kitchen floor to walk on. In case, you sought a more elegant and refined look consider buying quarry tile. The limestone and clay based tile are quite alike natural stone, which makes it more expensive than the traditional ceramic tile, but it looks stunning if installed correctly. When it comes to buying tiles for the kitchen the sky is the limit. So look for more options and pick a tile that best meet your budget and requirement to make your cooking area the one you have always dreamed of! For example, your backsplash can use painted and glossy tiles since it won’t take direct heavy traffic. Yet, these tiles have to bear hot oil spills, grease, and daily cleaning. To gain more insight on tiles, connect with a professional construction company in Pakistan like AmerAdnan Associates that has a solid repute and hands-on knowledge as well as experience in construction and designing.